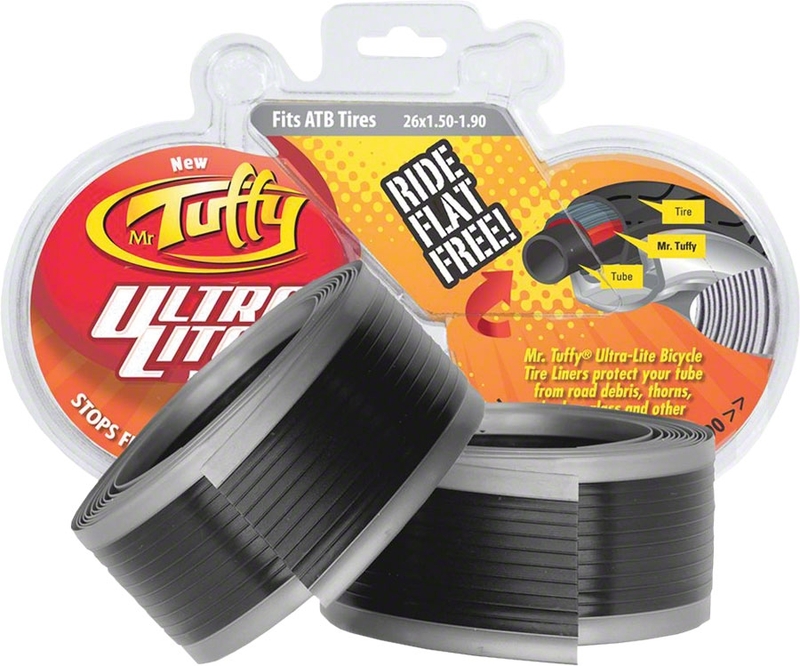 Mr. Tuffy Ultralight Tire Liners, 50% lighter than standard Mr. Tuffy Liners. Mr. Tuffy Ultra Lite Silver 26 x 1.5-1.9"
PART NUM 939450 Usually ships in 1-2 business days. 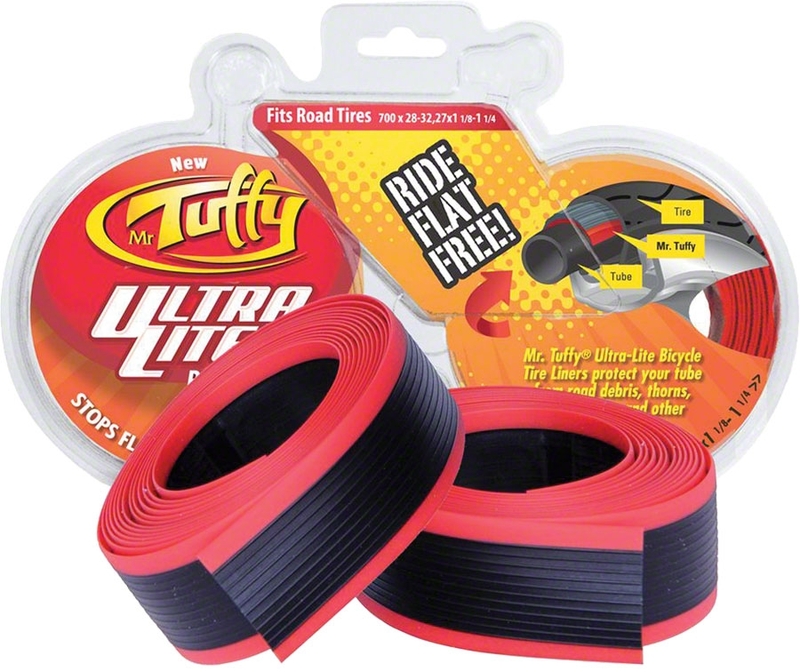 Mr. Tuffy Ultra Lite Red 700 x 28-32, 27 x 1-1/8-1/4"
PART NUM 899253 Usually ships in 1-2 business days. 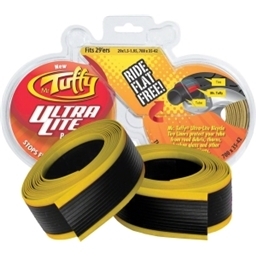 Mr. Tuffy Ultra Lite Gold 700 x 32-41, 29 x 1.5-2.0"
PART NUM 100752 Usually ships in 1-2 business days. 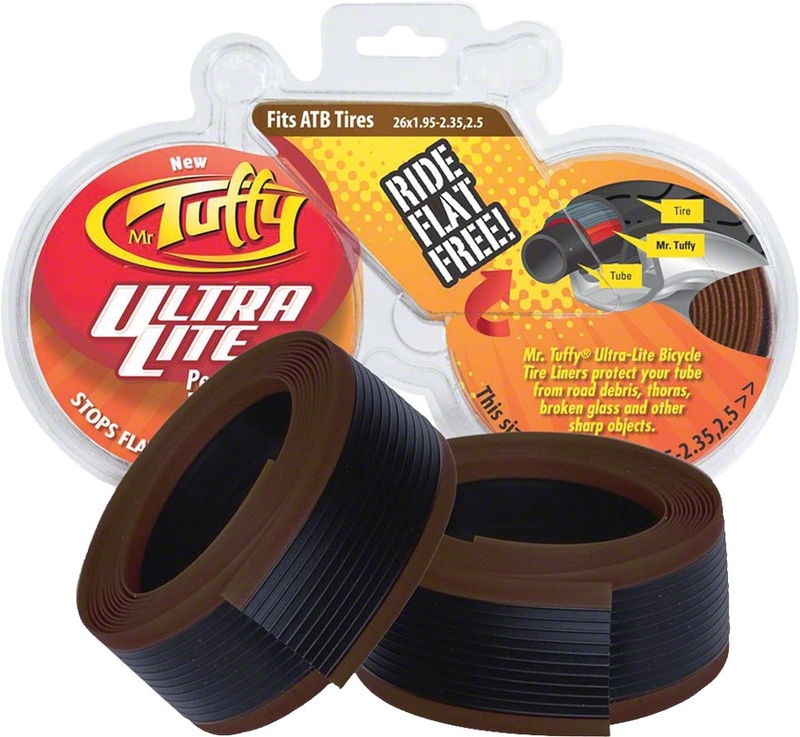 Mr. Tuffy Ultra Lite Brown, 26 x 1.95-2.5"
PART NUM 699012 Usually ships in 1-2 business days. 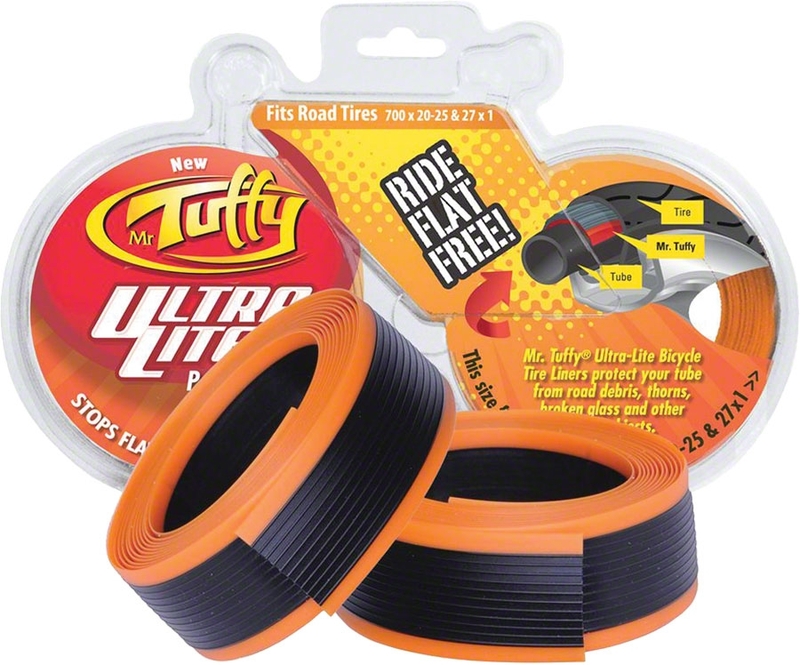 Mr. Tuffy Ultra Lite Orange 700 x 20-25 / 27 x 1"
PART NUM 960407 Usually ships in 1-2 business days. Light, but if you live in goat head country, consider the beefier type. 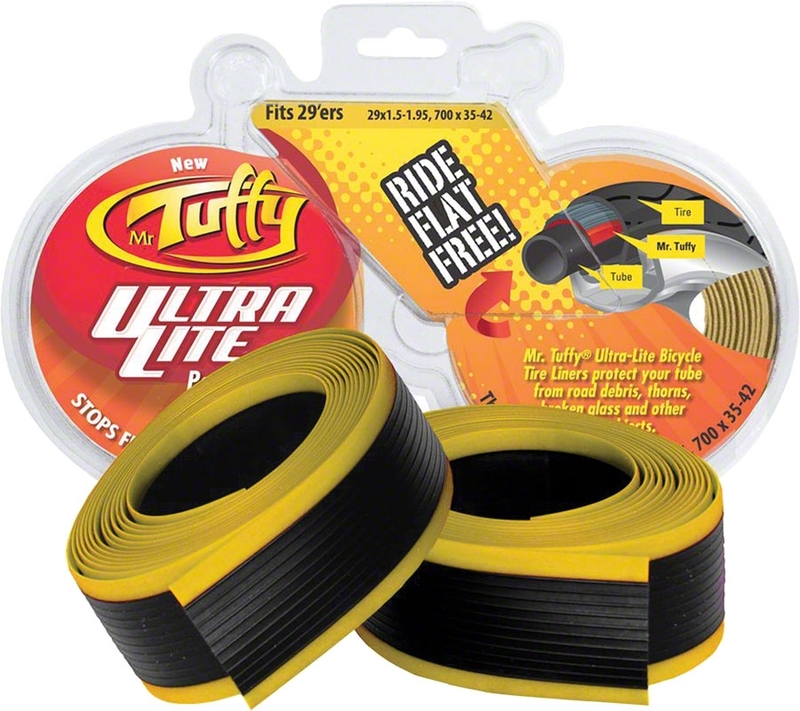 Product: Mr. Tuffy Ultralight Tire Liners: Mr. Tuffy Ultra Lite Gold 700 x 32-41, 29 x 1.5-2.0"
Product: Mr. Tuffy Ultralight Tire Liners: Mr. Tuffy Ultra Lite Red 700 x 28-32, 27 x 1-1/8-1/4"
Requires an extra step when mounting new tires. Adds a minor amount of weight. I commute every day on urban core streets riddled with glass and debris. I have never had a flat when using Mr Tuffy's tire liners. 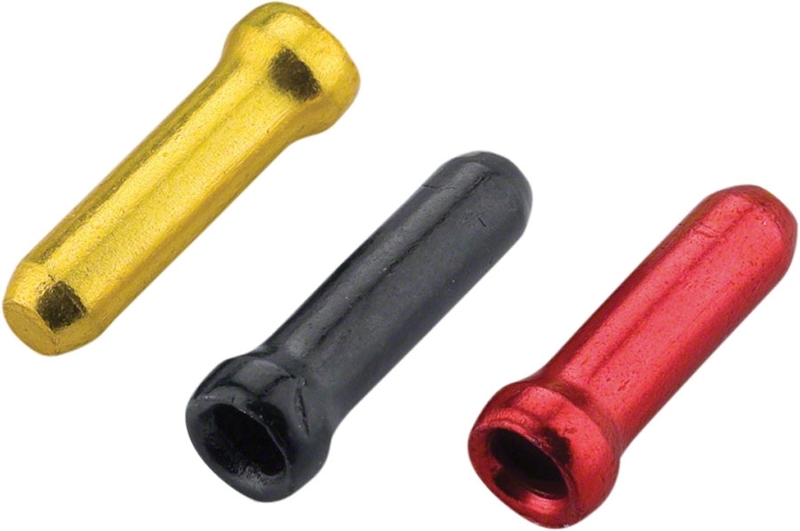 Probably won't stop a nail, but they will add a layer of protection from many types of potential punctures.